Come experience the most popular and longest running, pre-tournament event in Bowling Green Am history! 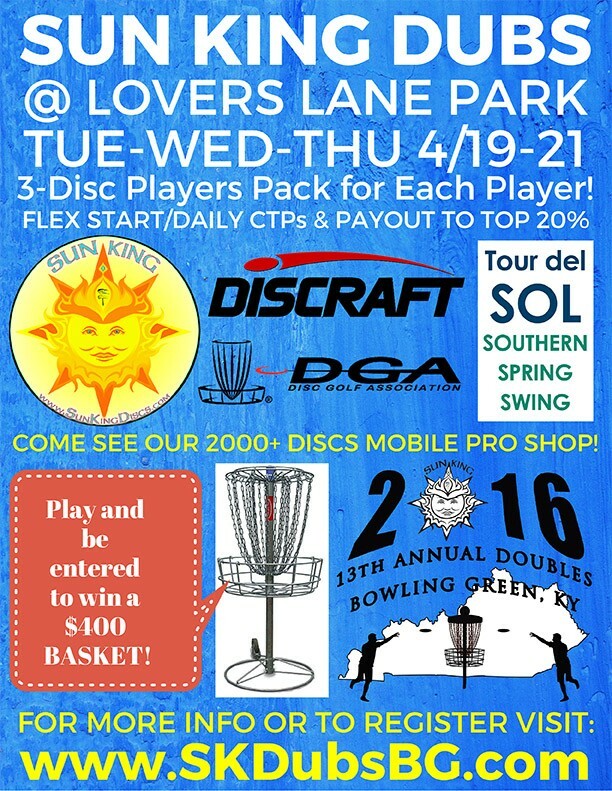 Sun King Doubles typically draws 200+ players each year and it gets much more exciting this time through with the addition of Discraft as the primary event sponsor! Sun King is giving away (1) Discraft ChainStar Portable Basket to a lucky winner! Valued at $400, each player who plays in the 13th Annual Sun King Doubles @ Lovers Lane will be entered to win. The drawing will be held Friday night at the FlyMart at the Discraft booth. Players choice of (3) Discraft Discs! 15 MODELS TO CHOOSE FROM! a $100+ total team value! JUST WANT THE AWESOME PLAYERS PACK? Just swing by Lovers Lane Park during our scheduled time frame and pick one up! Cost is $35 and includes everything mentioned above. Note: Purchasing the Players Pack separately does not include entry for the Discraft ChainStar Portable Basket drawing. No worries, show up and we will match you with another player or you can opt in to play "Cali". Single player also can pay a double entry fee and receive two throws for each shot instead of opting in to play "Cali". Sun King Enterprises, Inc. is responsible for all refunds/cancelations.